Do you keep ducks as well as chickens? Then perhaps you would be interested in building this cute little home for them. It looks just like a gingerbread house! Similar in design to the New England Cape Chicken Coop, this duck house will make a nice home for your ducks! It is designed to sit inside a large run, or you can easily attach a run. When built, it measures 4' wide x 6' long, not including the nesting boxes, and it is 4'-8" high. It will house up to six ducks. 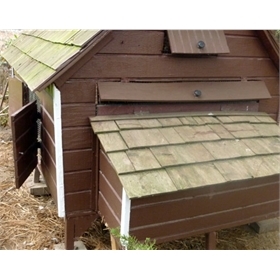 This duck house design has a hinged roof and a linoleum floor for ease of cleaning. The nesting box lid over the three nesting boxes is hinged for easy egg collection. Front and side vents provide good ventilation and they all have closing latched doors. The front door also closes with a latch. The materials will cost approximately $250. All costs are estimates and may vary by location. On the order confirmation page, on the final page of the online checkout process, you will see a link to download the plans. Don’t worry if you miss it! We’ll also email you a download link separately, valid for 7 days after purchase.